Thotta Kura Pappu is an Healthy & protein Rich Andhra Recipe made with Thota kura(Amarnath Leaves). It can also be prepared with any type of Greens. 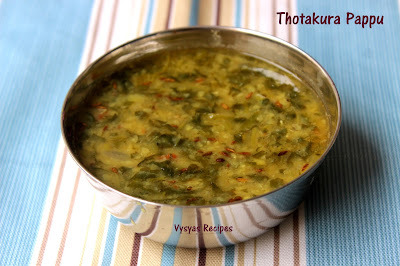 it is called Mulai keerai in Tamil.Cooked dal & Greens when blended together with tangy tomatoes tastes divine. Amarnath leaves have high protein & fiber content.Amaranth leaves contain a wide range of minerals, including a high concentration of calcium for stronger & healthy bones. Thotakura/ Mulai Keerai - 1 bunch. Remove the Root Part of Greens ( tender stems can be used) & soak it in a water for 10 minutes. So that dirt gets settled at bottom of the vessel. Then wash the Greens 2 -3 times, till the water is clean & drain it. Chop the tomatoes, crush the Garlic & slit the Green chillies. 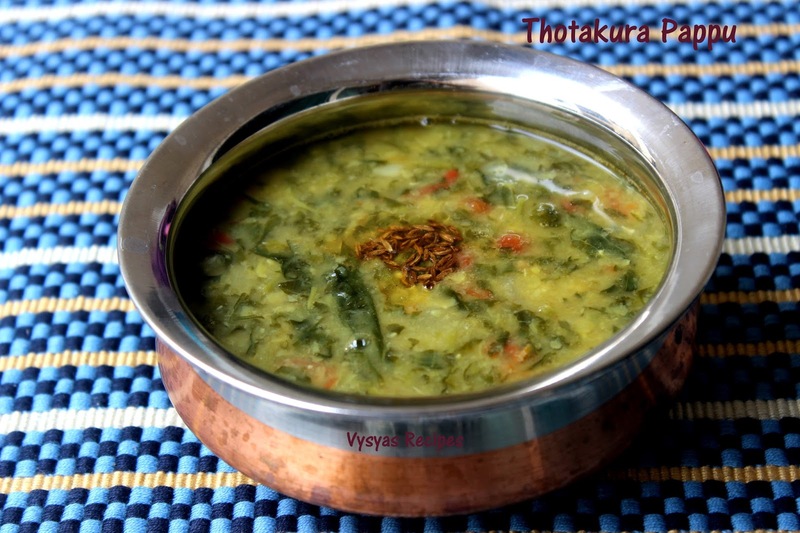 Pressure Cook Toor dal + Moongdal together with turmeric & needed water till soft & mash it. Heat the oil, add pearl onions,Crushed Garlic & slit Green chillies. Saute till onions turns Pink. Then add Chopped Greens, add little salt. Saute now & then at medium flame. Greens oozes water & it gets cooked with it. When the water is almost absorbed, add chopped tomatoes, saute till it turns mushy. Then add mashed dal with needed water & salt(adjust salt). Let it boil for few minutes till it gets little thick consistency. Switch of the flame & mash it well. Finally heat the oil, add cumin seeds when it sizzles add hing give a quick mix & pour over Pappu. I used Mulai keerai instead you can use sirukeerai, Araikkerai, or Thandukeerai. Always use Pearl Onions for Good taste. crushing the Garlic gives nice flavour to dal. Saute the Greens with little salt in medium flame.Greens oozes water & leaves gets shrinked & cooked with that water itself. This is something new and intriguing to me! Been long time since I tried this. Started getting these greens here. Should try this out soon.